TORONTO, ON – Left Field Brewery has announced the release of a new seasonal beer created in collaboration with another local business. To create this tasty mocha-inspired treat, we developed a sweet stout recipe and added roasted, crushed cocoa nibs and a blend of Brazilian Sweet Jesus coffee beans during conditioning. The result is a rich and decadent blend of chocolate, caramel and sweet orange. To replicate marshmallow flavour we added lactose – an unfermentable sugar that gives the beer a sweet creaminess, reminiscent of our fondest childhood campfire memories. 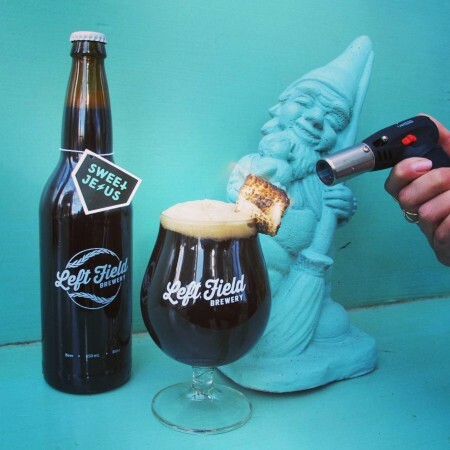 Sweet Jesus Mocha Marshmallow Stout is available now at the Left Field brewery taproom and retail store, and on tap at select bars and restaurants in Toronto.